In this post Ben Cislaghi draws our attention to two points that might contribute to our thinking about norms and corruption. The first is that social norms are not an on/off switch: their strength varies as the characteristics of the practice the influence varies. Yet, it’s important to include them in a programmatic strategy even when their influence is weak. The second (and related) point is that effective change in a practice requires, sure, addressing the norms that sustain it; but that interventions should address the various material, institutional, individual and social factors that intersect (and possibly justify) the norm. In this post, he presents a dynamic framework to make sense of similar factors. Social norms, the unwritten rules of behaviours shared by members of a given group or society, can contribute to corruption. 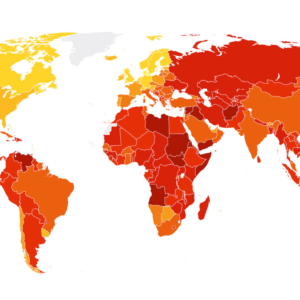 Many studies exist showing the importance of changing norms to reduce corruption rates. With this post, I want to draw your attention to two points that might contribute to your thinking about norms and corruption. The first is that social norms are not an on/off switch: their strength varies as the characteristics of the practice the influence varies. Yet, it’s important to include them in a programmatic strategy even when their influence is weak. The second (and related) point is that effective change in a practice requires, sure, addressing the norms that sustain it; but that interventions should address the various material, institutional, individual and social factors that intersect (and possibly justify) the norm. In this post, I present a dynamic framework to make sense of similar factors. 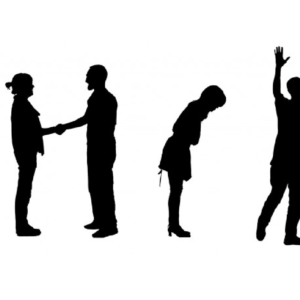 Most readers of this blog are probably already accustomed to standard definitions of social norms: the informal, mostly unwritten, rules of obligatory, appropriate and acceptable behavior shared by people within a given group or society. If you are one of those readers, feel free to skip this section, that is mostly a refresher of social norms theory. Social norms obviously vary by context; what’s expected of a well-behaved person might not necessarily be the same in Italy, Japan, and the United States. Norms in the US exist that you should tip the waiting staff at the restaurant, but that is considered profoundly offensive in Japan. Norms can sometimes act as a break to positive change. 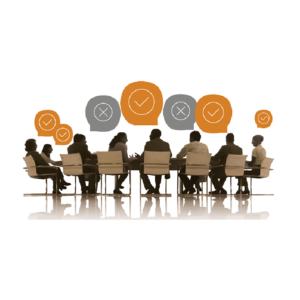 Even though members of the group might personally not want to comply with the norm, they might still comply, believing that’s what everyone expects of them. If nobody ever breaks them (or only if few do) norms (including harmful norms) sustain themselves overtime – even when most members of the group where the harmful norm is active don’t personally like it. History abounds of similar harmful norms that were abandoned when people realized that little support existed in their society for it: foot binding in China, dueling in the 19th century, or – as some argue – more recently female genital cutting in West Africa. This well-known phenomenon, when most people in a group don’t want to do something but they do it to please others, is known in the literature as “pluralistic ignorance.” Of course, this is just one of many ways in which norms and attitudes (“what people want to do”) can intersect. (see figure 1). Figure 1. 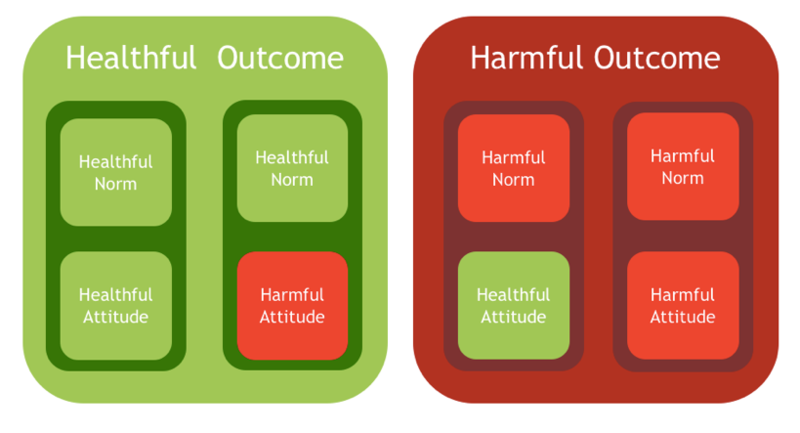 Possible interactions between norms and attitudes (when the norm trumps the attitude). The varying strength of social norms. In a paper by myself and Lori Heise, currently under review, we argued that the strength of the influence of social norms varies, falling on a spectrum. On the strongest end of the spectrum are norms that shape “obligatory” behavior. Vaccinating children, for instance, would fall under this category: not only do I need to vaccinate my children to achieve my own goals (preventing disease), but other people will also enforce it as my noncompliance can prevent them from achieving their goal (if too many people are left unvaccinated, vaccinations are useless). On the stronger end are norms that shape appropriate behavior. Think, for instance, of an adolescent who wants to impress her school friends and picks up smoking to be accepted in their group. The adolescent needs others’ approval to achieve her goal, while others don’t need her to keep their status. Slightly weaker influence is exerted by norms that shape beliefs of tolerated or acceptable behavior. As an example of such a norm, think of a man harassing a woman in the street, expecting little reaction from bystanders. Finally, at their weakest point, normative beliefs can shape ideas of what is possible. A farmer knowing that everyone in her region is using a new type of rice might decide to adopt it, without telling anyone, just under the belief that’s what all other farmers are doing. Corruption-related norms might fall at different points on this spectrum. As a state officer, I might feel obligated to request money for services as I am afraid my colleagues will come after me if I don’t: they might feel threatened by my behavior as it might challenge what people expect from a state officer. Or I might want to report a corrupt senior official, but think that’s not appropriate, fearing the punishment of the group. Or again, I might know that corruption is tolerated, so be bold about asking money for standard services, knowing that nobody is going to come after me for doing so. Or, finally, I might be a new officer joining a state department, and – thinking that everyone in the nation is corrupt – I might just think of it as a concrete possibility in my work. When they are at their weakest, practitioners might imagine that norms have negligible influence. And yet, even at their weakest, they can put a brake on positive change. Practitioners might wonder why, having changed all other conditions contributing to a given practice, they might not witness change as a result. One of the possible answer is that they might have to address the related norms as well. Effective interventions embed norms within a dynamic framework. 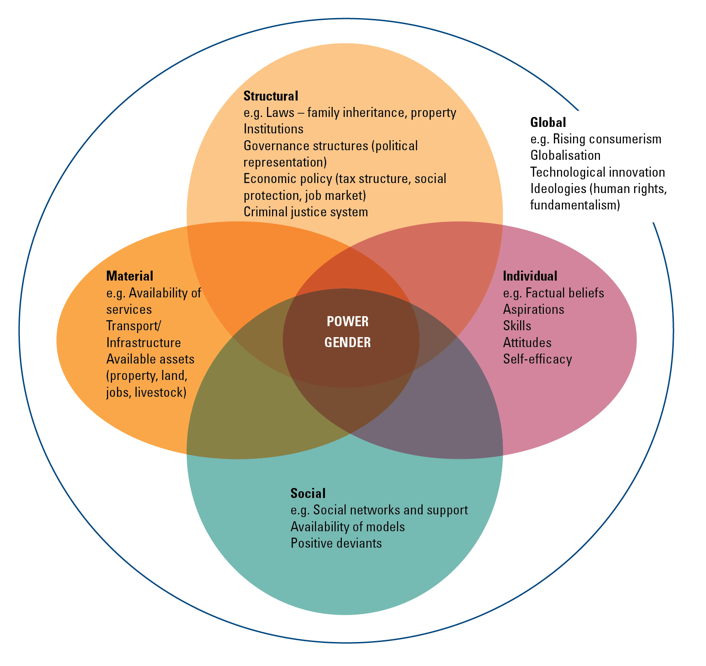 Figure 2.The Flower Framework: A dynamic framework for change. Source: Cislaghi and Heise (under review). Take for instance the intersection between material and social: the way a hospital is built might need to take into account the stigma faced by women seeking help for issues related their sexual health in a given community (as we had found in a qualitative study on fistula1). Effective interventions would need to map all the different factors sustaining corruption, including, just to cite a few: the material needs of the population, the laws and policies, how officers implement those laws, the knowledge that citizens have of those laws, family structure, and the weak and strong norms protecting corruption practices in the given setting of the intervention. In conclusion, we suggest that when planning an anti-corruption intervention it is critical to understand the strength of social norms’ influence over various behaviours that sustain corruption, and interventions are designed to address the interaction of norms with other institutional, individual, social, and material factors. We hope that the flower framework might serve as a framework for practitioners willing to engage in a diagnosis of those factors. Cislaghi, B. and L. Heise, A dynamic framework for using social norms to prevent harmful behaviours in low and mid-income countries. under review. Ben Cislaghi is Assistant Professor in Social Norms at the London School of Hygiene and Tropical Medicine (Centre for Gender, Health and Violence). Before joining the academia Ben worked for various NGOs and International Organisations, including UNICEF, WHO, and ILO. After his PhD, on human rights and social change, he worked for three years in Senegal as the Director of Research, Monitoring, and Evaluation of Tostan, a non-governmental agency internationally recognised for their work on social norms in West Africa. During this time, he also worked as a qualitative researcher with Stanford and Columbia Universities. At the LSHTM he is gathering a community of experts on social norms, advancing existing understanding of how norms change and how that change can be measured. He is also contributing to the LINEA project. He is interested in how community-based responses can achieve change in social norms and reduction in gender-based violence, and in the role of social norms among other factors in influencing people’s actions. His second book, Human Rights and Community-led development, is forthcoming with EUP.